This month the spotlight is on our very own Service Adviser, Derek Mason. Derek is a new face to the company, having only worked at College Chevy for about three weeks. He’s been in the automotive industry for a couple years and previously worked as a Tire Technician at a discount tire shop. Derek is originally from South Lyon, MI but now resides in Grass Lake where he enjoys going on nature walks or outdoor adventures with his dog Buddy. Derek also enjoys watching That 70’s Show, but when football season is here, he spends his time cheering on the Detroit Lions and Michigan Wolverines. As for the automotive side of things, Derek currently drives a 2015 Chevy Sonic and it’s his favorite car he’s ever owned. If he could chose a car that would match his personality, Derek would say the Colorado fits him perfectly. Even though Derek has a lot of Chevy favorites, his dream car is a 2014 Chevy Camaro ZL1 that he fell in love with the first time he took it for a ride. We are very excited to have Derek as part of our staff and we hope you get the opportunity to work with him in our service drive. His favorite part about his job is being able to help out the customers, so don’t hesitate to come to Derek with any questions or concerns that you have. Meet one of our newest team members, David Benham! David is a new Sales Consultant and has been with us for about 2 months. Before working at College Chevrolet Buick, David spent 37 years in Education and taught at Bellevue Schools for 29 years. David is from Homer, but currently resides in Marshall. He is a proud graduate of Michigan State University. (GO SPARTANS!) Speaking of which, David has been a MSU season ticket holder for over 30 years. When not at work you’ll catch David watching college sports or watching his daughters play volleyball. He also enjoys officiating high school basketball, baseball, and softball games. His favorite television show is currently “Moonshiners”. His all-time favorites include “Gilligan’s Island” and “The Andy Griffith Show”. David’s dream car is the Chevrolet Tahoe because of its versatility and the ability to go off-road. He currently drives a Honda CR-V, but his favorite vehicle of all-time was his S-10 Blazer. He thinks that the Chevy Impala matches his personality best and the worst car he’s ever driven was a Ford Galaxy 500 because it was rusted and falling apart. So far, David has enjoyed meeting people and helping them find the perfect new vehicle. We would love for you to stop by and say “Hello!” to one of our newest team members, David! He would love to help you find the perfect new vehicle! Mindi Tompkins. What’s Your Story? This month we want to recognize one of our newest employees, Mindi Tompkins! Mindi is our new Office Assistant and has been a part of our team for just a few weeks. She is originally from Jackson, MI and attended Jackson College for school. She stays involved in the town by helping out with the Lumen Christi Cheer Team, as well as cheering on the Detroit Red Wings! When Mindi’s not helping cheer on a team, she enjoys watching Shameless or her favorite show of all time, The Bachelor. When it comes to cars, the best vehicle Mindi has ever owned is her Kia Optima that she currently drives now. Her dream car would be a yellow Chevrolet Corvette Stingray convertible so she can cruise down California State Route 1 with the top down. If Mindi could pick her favorite car on our lot, she would choose between either the Chevy Impala or the 2500 Silverado Duramax in all black. Mindi has been around a variety of vehicles, which makes her a great asset to our team. If you find yourself in our dealership, come stop by and say hi to one of our newest employees. Mindi loves working with a team that is committed to helping each other and their customers. Let our team help you find a brand new car that is perfect for your needs! Visit College Chevrolet Buick today. Leo Smith is an automotive technician here at College Chevrolet Buick. He is from (and currently lives in) Marshall, Michigan and spent some time studying at Lincoln Tech (DADC) in Denver, Colorado. Leo is newer to our team, he started in September just last year. Although he is newer to us, he has been in the automotive industry for 13 years. Leo’s dream car is a Factory Five GTM because you build it yourself so you can make it exactly how you want. He also likes the fact that it’s powered by the Chevy LS1. When not at work, you’ll find Leo camping, cycling, single board computing, python programming, and watching comedy shows. His favorite recent television show is Mr. Robot, but his all-time favorite is The Eric Andre Show. Currently, Leo drives a Mercury Milan. He would like to mention that the Milan was featured in Jalopnik’s “Meh Car Monday“. His favorite car he’s ever owned was a Mazda Rx7 Turbo 2, he also says that this car was his most unreliable. His favorite Chevy model is the Camaro ZL1, but says that his personality most resembles a Subaru Forester because he is reliable. 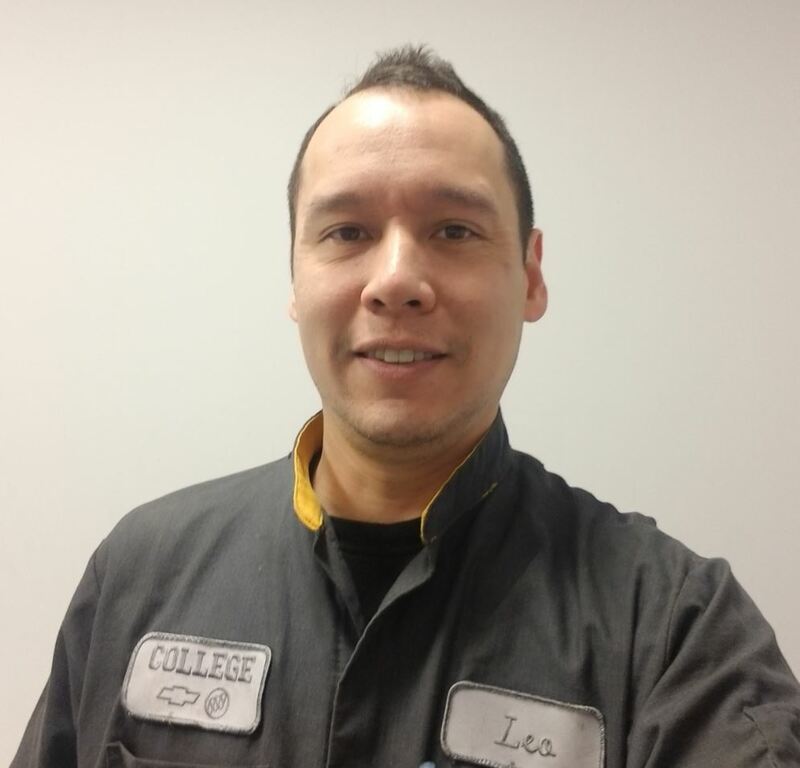 Leo enjoys working in our service department because he likes to diagnose tricky problems. He feels rewarded when he completes a diagnosis. The next time your vehicle needs serviced, rest assured that Leo will be ready to help!